The MIRAGE lab is pleased to announce another publication using the MIRAGE system. The research article is called, "Spatial compression impairs prism-adaptation in healthy individuals" (link) and uses MIRAGE to compress the visual workspace in order to model Neglect prism adaptation performance and is published in the Journal Frontiers in Human Neuroscience. Neglect is a disorder that can occur following brain injury, which causes the patient to have reduced awareness of the left side of space. 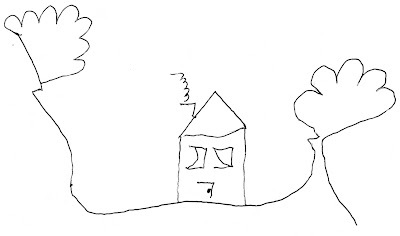 This is a picture drawn by a patient suffering from Neglect. You can see that when drawing the house he misses out the left side of the chimney, the door and each of the windows as well as the left side of the left tree. Wearing rightward optical prisms over your eyes makes everything appear to be to the right of where it really is. When you try to reach and touch something you miss to the right. After a while you get used to the prisms and can reach accurately again (adaptation), but if you take them off you suddenly start missing to the left for a while (the aftereffect). The processes of adaptation and the aftereffect can help to reduce visual neglect. Neglect patients do not adapt to prisms in the same way as healthy people. This may be due to an abnormal compression of their visual workspace. Research of this kind can help us to further understand changes in the brain that cause the disorder and also help understand mechanisms underlying temporary restoration of awareness following prism adaptation.